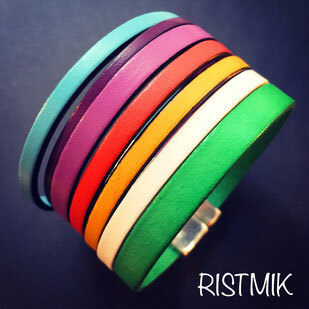 RISTMIK is a french brand wich produces timeless, audacious and colored leather accessories. We put a lot of care in the choice of our materials selected exclusively in Europe. Leather strips are the link of all our creations. They are scrupulously chosen for their colors, their textures, their peculiarities and of course their quality. Each cuff bracelets is unique and can be on-demand customized; nobody will have the same as you. Our catalog of jewellery and accessories RISTMIK is in constant evolution following our inspiration and feelings.